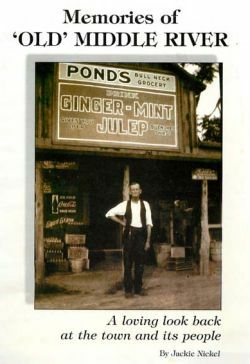 This binder contains articles and photos of Guttenberger’s General Store. 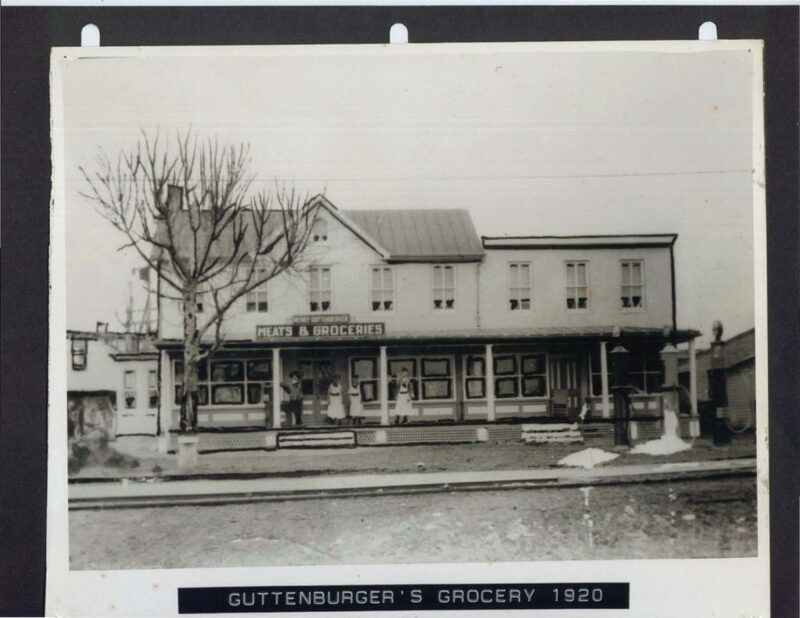 Guttenberger’s, the first grocery store built in Essex, Maryland in 1909 by the Taylor Land Co. was located on the corner of Eastern Avenue and Mace Avenue. It was purchased by Henry Guttenberger as both a home and a store. 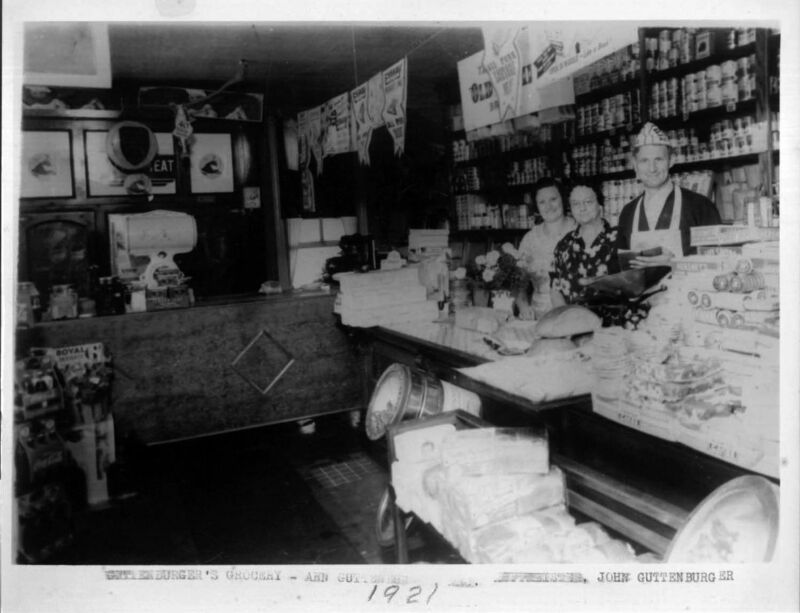 In 1921 Guttenberger’s Store was the hub of neighborhood activity. Anna Guttenberger, Mrs. Hofsteter (an employee) and John Guttenberger. A chapter of Essex history concludes today as John Guttenberger closes for the last time the doors of the general store at the corner of Eastern and Mace that his family first opened in 1910. Poor economy rather than age or health is the reason John cites for his retirement. “I’m lucky if I sold one soda and a pack of cigarettes a week in the last few months,” says the white-haired proprietor who has been a fixture at the store since age eight. Now with his business licenses up for renewal June 1, the 88-year-old gentleman is ready to close shop rather than face another year of losses. John, along with his nephew George Guttenberger and niece Joann Geiger gathered recently to reminisce about the significant role of their family in Essex history. John’s memories go back to the early 1900s in Highlandtown where Henry and Barbara Guttenberger began raising their family with John the oldest, then Mike, and later Anna and George born in Essex. 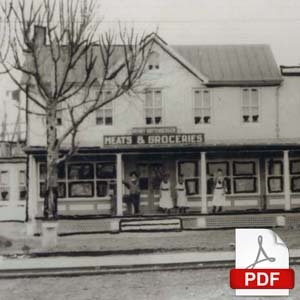 Henry was a grocer with a store on Lombard Street and a home on Foster Ave. He had aspirations to offer his family a better way of life – a life in the country. Beckoning to the east down the shell road and across the sparkling waters of Back Rive, was a new way of life, an innovative development called Essex: “the rising suburb of the east,” so dubbed by the developer. Sixteen cents a day could buy a lot, priced at $150 and up – “about 2¢ a square foot.” Terms were $5 down and $5 a month. 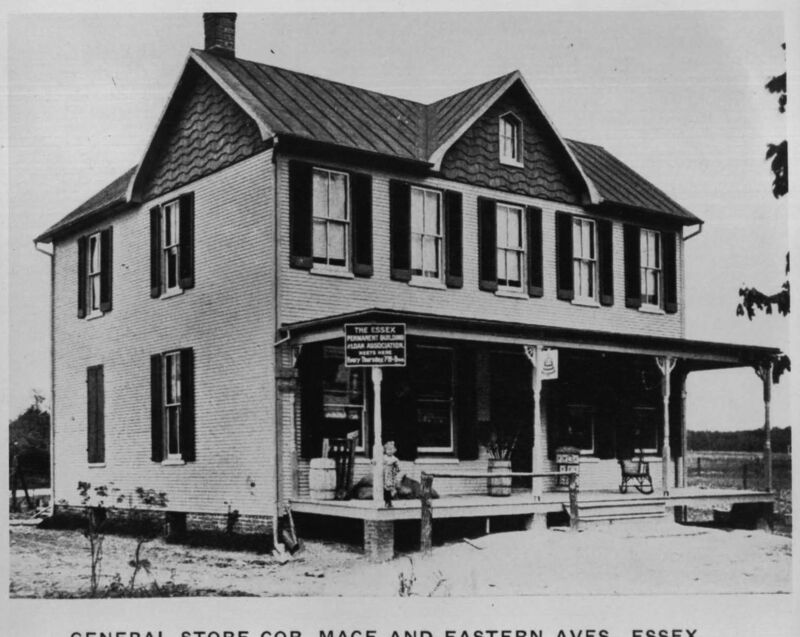 Henry Guttenberger, a wise businessman as well as a smart investor, knew as the settlement of Essex grew, so would the need for a general store. He approached the Schluderberg-Kurdle (Esskay) Company for backing and in 1910 moved into the custom-designed store with upstairs living quarters at the prime location in the center of Essex. The store was equipped with solid oak shelves, decorative moulding and built-in bins for spices and vegetables. Remarkably, it looks much the same today. A wide front porch allowed for lounging by customers who frequented the store not only for groceries, but for dry goods including clothes, and even for Henry’s services as justice of the peace. The name “Essex” did not catch on right away, recalls John. Folks still referred to the growing community as Rossville, the postal designation. Attached to the store was a packing house where local truck farmers would bring their tomatoes to be canned. John remembers looking across the shell road and seeing nothing but woods: a glance to the left would bring a glimpse of the one-room schoolhouse (now the comer of Taylor Ave.) An occasional horse and buggy would pass by: the streetcar line went only as far as Back River Bridge. John began working at the new store almost immediately, putting in full-time hours after he left school at the end of third grade. “All us kids worked in the store,” he explains. Besides waiting on customers, weighing food and stocking shelves, they also delivered to customers’ homes, either by foot or horse and buggy. As the community grew, so grew the business. “Doing $1,000 business on a Saturday was nothing,” interjects Mr. Guttenberger. Social life in those days revolved around the church and the Guttenbergers were loyal members of Our Lady of Mt. Carmel Parish, attending weekly if not daily Mass, chicken dinners, plays and other “socials.” There were lots or kids in the neighborhood to call on for a game of stick ball, tag or a romp in the woods. Henry Guttenberger had milk, bread and meat delivered to the store but made a weekly buggy trip to Baltimore markets for products such as Gold Dust soap powder, Fels Naptha and Octagon soap (a few or which still sit on the shelves). By the 1920s, the store had added gasoline pumps for automobiles and was delivering goods as far away as Middle River. Some of the early customers John recalls are Joe Banz, Ida Hawk, Melvin Brehm, Charles Fousek, Ronald Benedict, Thomas Seubert, John Reese, Laura Regulski, Howard Hundley, Joe Schamer and Marie Bradley. In 1921, John’s brothers George and Mike left the store to open a car agency selling Model T’s and other automobiles on an Eastern Ave. lot where the Essex Medical Center now stands. 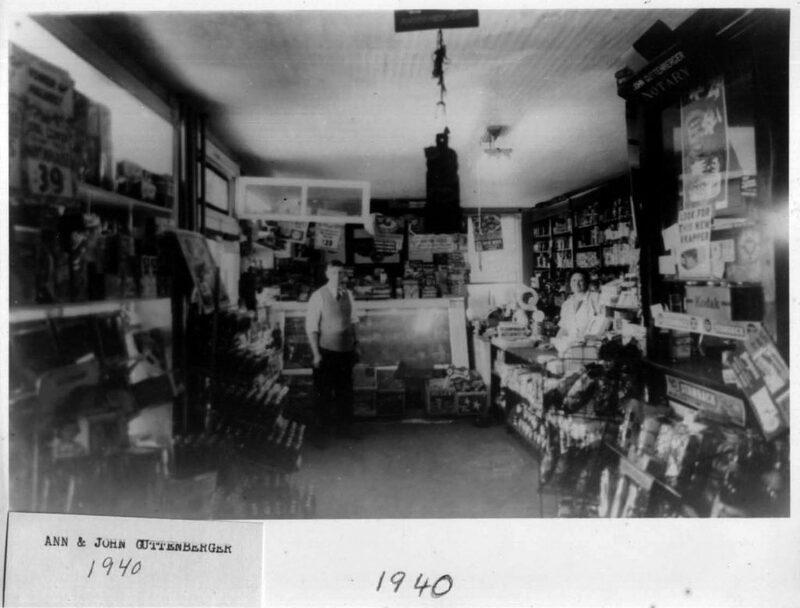 Neither John nor his sister Annie ever married and continued running the store with their dad after their mother’s death in 1929. In the 30s, the Depression was felt by the business as well as the family. Folks were just buying necessities, relates John. As for the Guttenberger family, Henry, who always enjoyed “gunning”, began bringing home more of his prey to help feed the clan. Unfortunately, the 50s began a downward slide for the store which never quite recovered to its previous prosperity. A massive fire in the Essex business district put many merchants out on the street and although Guttenberger’s wasn’t affected physically, it drained shoppers from Essex to other areas such as Middlesex and Eastpoint. 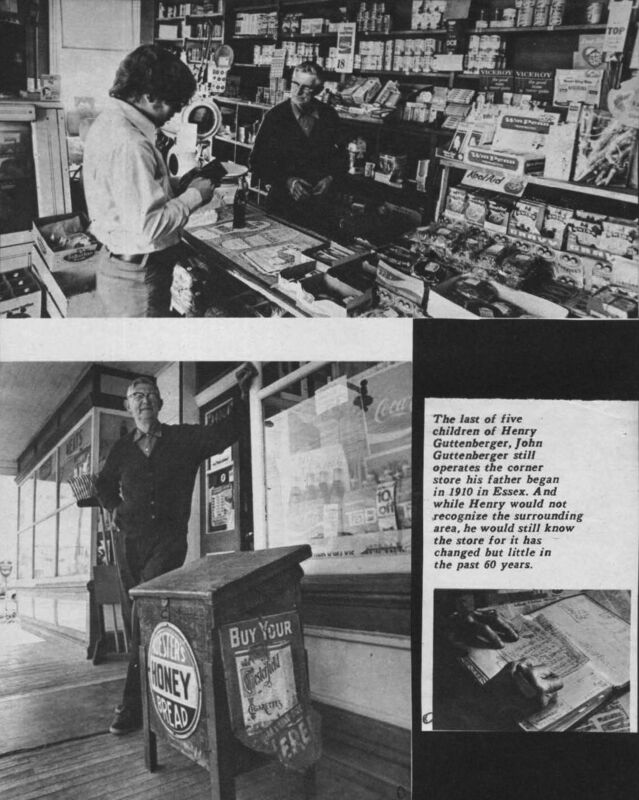 A lot of well-known people have 10 visited Guttenberger’s Store, recalls owner John Guttenberger who closed the business last week after 81 years of operation. Long a meeting place for locals, the store was also visited by former politicians Ted Venetoulis, Don Hutchinson. Dennis Rasmussen, and Norman Lauenstein and was the subject of several newspaper articles which John has saved. Just a few 11 weeks ago Guttenberger’s was featured on WJZ’s “Maryland by George” with George Baumann who discovered the store while In Essex on another assignment. Some of the most frequent clients of bygone days were children. Coming In with a nickel, they spent many minutes choosing penny candy from the confection case. John’s niece Joann Geiger especially remembers the red hot dollars, lollipops and licorice sticks. A dime would buy you a whole bagful. Although Guttenberger’s never had a fountain, they served hand-dipped ice cream which kids would sit out on the front steps to eat. When his sister Anna died in 1965, John took over the business singlehandedly, closing only in the event of severe illness. “He’s never had a vacation and never travelled past Towson,” interjects nephew George Guttenberger. John never considered modernizing the store, other than replacing the porch when it began to deteriorate. The same oak shelves, old- time meat scale and cash register that greeted customers years ago are there today. John’s retirement was not a long-planned event. “I just made up my mind a couple weeks ago.” nods the owner. License fees were due and business down to almost nothing. 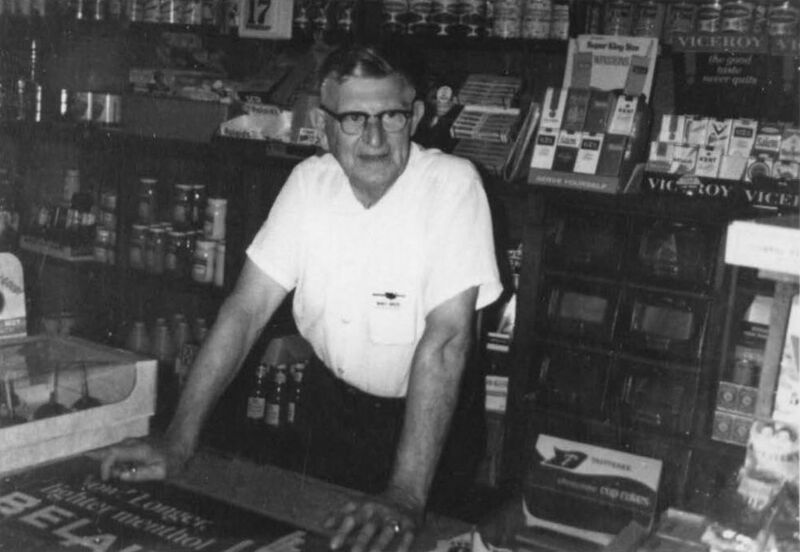 John hasn’t handled meat at the store for over 10 years and a few staples, sodas, and cigarettes were the mainstay of his stock. …next day. They regularly “charged” a week’s groceries with the tab tallied by John In a large ledger: he never used an adding machine. There were a few, however, who never paid up, and their names are still recorded in the back or John’s ledger. Most are dead now. About the only hobby John kept up with over the years has been caring for the plants which decorate his storefront windows, some 50 years old. John still drives a car, but only to church on Sunday. Although his roots are at Mt. Carmel where he served as an altar boy and attended dally Mass for years, he switched to St. Clare’s Parish since it was less distance to travel. One plan John announced last week is sure to please his old friends and customers – he says he and his 14-year-old dog Boomer will continue to lounge on the wide wooden porch or the store when weather permits. Old habits are hard to break. Seated: Mary Corey (Treasurer), Laura Hensler (Vice President), Alex Baumgartner (President), Helen Baumgartner (Secretary). Standing: Horace McCarter (Publicity), Emma Dunham (Trustee), Earle Scoggins (Sergeant at Arms), Virginia Borsos (Trustee), John Ruley (Historian), Kay Wolfe (Trustee). We thank our founding members Mr. and Mrs. Alex and Helen Baumgartner, their family, and peers for establishing our premiere Baumgartner Collection. 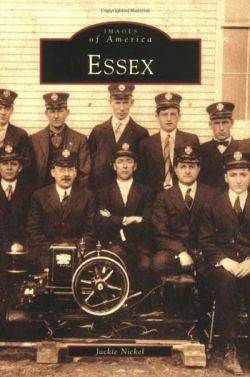 The collection captures a historical snapshot of life in Essex and Middle River, Maryland. The collection contains nearly 300 categorical binders documenting our community activities with articles, pamphlets, and photographs from 1969 through the 1980s. The Heritage Society has scanned the collection to our website to share with our extended community. 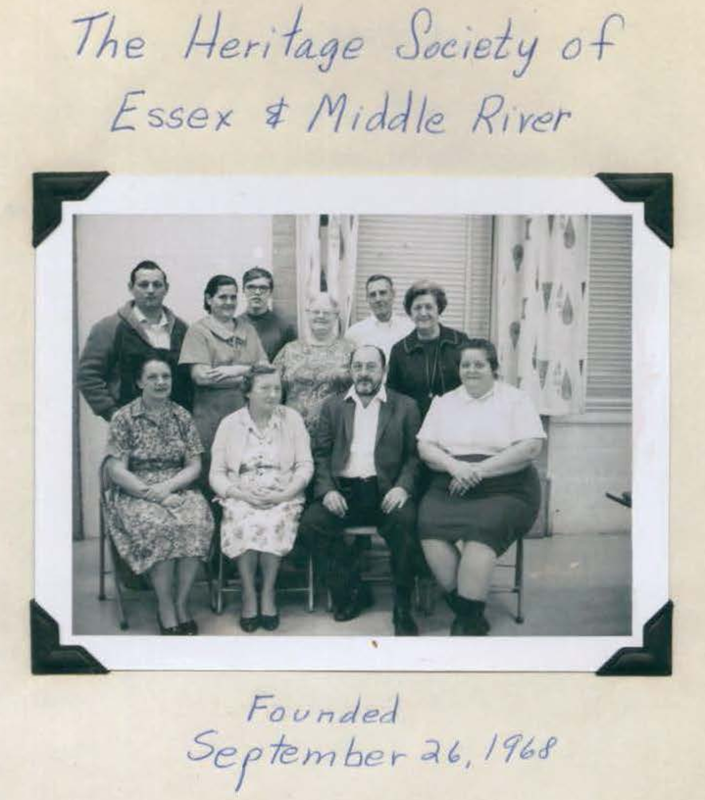 As we continue to build new collections, we are seeking new materials such as photographs and ephemera that pertain to the community and business history of Essex and Middle River. Please contact essexmuseum@gmail.comif you have historical memories or items to donate or would like to become a member.